Every year, nearly 4,000 children go to emergency rooms after swallowing button batteries—the flat, round batteries that power toys, hearing aids, calculators, and many other devices. Ingesting these batteries has severe consequences, including burns that permanently damage the esophagus, tears in the digestive tract, and in some cases, even death. To help prevent such injuries, researchers at MIT, Brigham and Women's Hospital, and Massachusetts General Hospital have devised a new way to coat batteries with a special material that prevents them from conducting electricity after being swallowed. In animal tests, they found that such batteries did not damage the gastrointestinal (GI) tract at all. "We are all very pleased that our studies have shown that these new batteries we created have the potential to greatly improve safety due to accidental ingestion for the thousands of patients every year who inadvertently swallow electric components in toys or other entities," says Robert Langer, the David H. Koch Institute Professor at MIT and a member of MIT's Koch Institute for Integrative Cancer Research, Institute for Medical Engineering and Science (IMES), and Department of Chemical Engineering. Langer and Jeffrey Karp, an associate professor of medicine at Harvard Medical School and Brigham and Women's Hospital, are the senior authors of a paper describing the new battery coatings in this week's edition of the Proceedings of the National Academy of Sciences. The paper's lead authors are Bryan Laulicht, a former IMES postdoc, and Giovanni Traverso, a research fellow at the Koch Institute and a gastroenterologist at MGH. About 5 billion button batteries are produced every year, and these batteries have become more and more powerful, making them even more dangerous if swallowed. In the United States, recent legislation has mandated warning labels on packages, and some toys are required to have battery housings that can only be opened with a screwdriver. However, there have been no technological innovations to make the batteries themselves safer, Karp says. When batteries are swallowed, they start interacting with water or saliva, creating an electric current that produces hydroxide, a caustic ion that damages tissue. This can cause serious injury within just a couple of hours, especially if parents don't realize right away that a child has swallowed a battery. "Disc batteries in the esophagus require [emergency] endoscopic removal," Traverso says. "This represents a gastrointestinal emergency, given that tissue damage starts as soon as the battery is in contact with the tissue, generating an electric current [and] leading to a chemical burn." 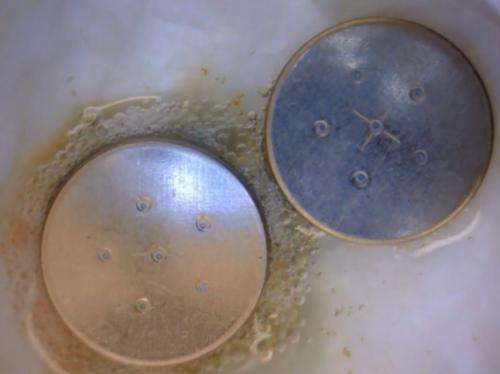 To verify that this coating would protect against tissue damage, the researchers first calculated how much pressure the battery would experience inside the digestive tract, where movements of the tract, known as peristalsis, help move food along. They calculated that even under the highest possible forces, found in patients with a rare disorder called "nutcracker esophagus," the QTC-coated batteries would not conduct. "You want to know what's the maximum force that could possibly be applied, and you want to make sure the batteries will conduct only above that threshold," Laulicht says. "We felt that once we were well above those levels, these coatings would pass through the GI tract unchanged." After those calculations were done, the researchers monitored the coated batteries in the esophagus of a pig, and found no signs of damage. Because QTC is relatively inexpensive and already used in other consumer products, the researchers believe battery companies could implement this type of coating fairly easily. They are now working on developing a scalable method for manufacturing coated batteries and seeking companies that would be interesting in adopting them. "We were really interested in trying to impose design criteria that would allow us to have an accelerated path to get this out into society and reduce injuries," Karp says. "We think this is a relatively simple solution that should be easy to scale, won't add significant cost, and can address one of the biggest problems associated with ingestion of these batteries." Also, because the coating is waterproof, the researchers believe it could be used to make batteries weather-resistant and more suitable for outdoor use. They also plan to test the coating on other types of batteries, including lithium batteries. This innovation should be mandatory, not voluntary. How will we ever eliminate the tendency to do stupid things if we keep saving the perpetrators? Obviously, tritace and kienhoa68 are either children themselves or have never dealt with children. It is also just as obvious, they have no concern for human life. God forbid, they should ever have children, themselves. Pretty interesting. This would also have applications for battery storage - currently button cells are somewhat dangerous if you pile them in a box, since they might touch in just the right way to form a circuit. This invention would seem to alleviate that issue. 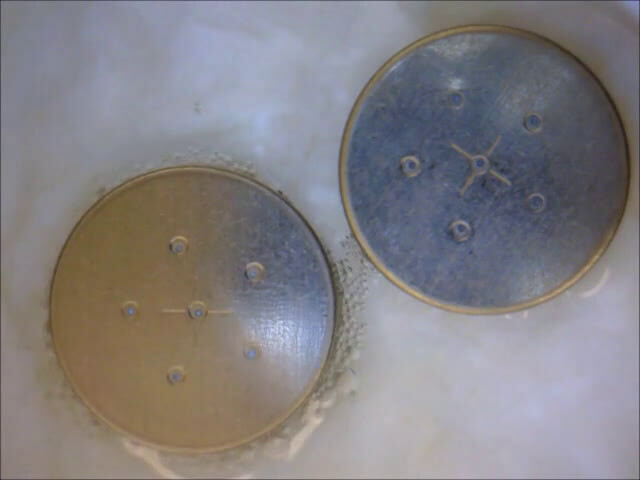 The one potential downside which will require a lot of testing, is that these button cells will probably be less reliable in high vibration environments, since the pressure will constantly be going above and below the threshold of conduction. They may require circuits to have buffer caps added, or battery holders will be redesigned to maintain higher pressure than they do right now. Regardless, this technology shows a lot of promise.